Is there a tool that can add a password to a PDF file? I've found lots of info on decrypting PDF files, but none on encrypting them. What tool can do this for me? Edit: There are two good answers below, but in my specific case the PDF was a scan, not a document that I'd created. qpdf can encrypt and decrypt pdfs. And linearize them, too. One possible solution is to use jpdf Tweak. Master PDF Editor is a very good GUI for editing pdf also can encrypt. It also uses latest PDF standard. Used PDF Chain and Master PDF editor, both to encrypt a pdf, With PDF Chain the PDF outputed was larger and lost bookmarks, was almost double the size. Not the answer you're looking for? Browse other questions tagged encryption pdf or ask your own question. 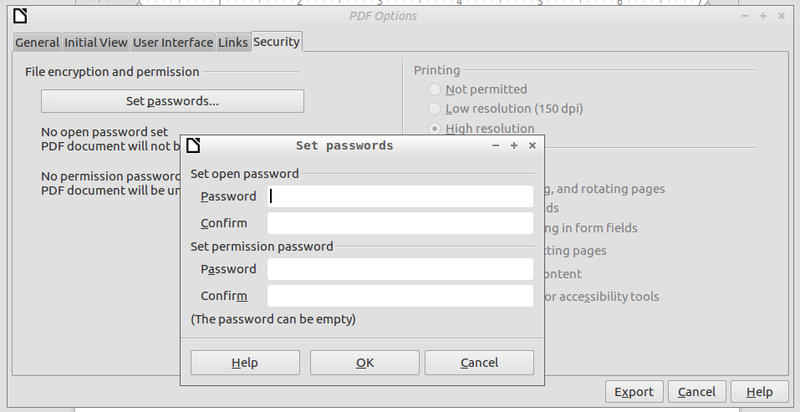 Is there a scanning program that creates pdf files with password protection? Which programs can I use to edit PDF files? How can I open a interactive PDF (created with Mingmanager software) in Ubuntu?